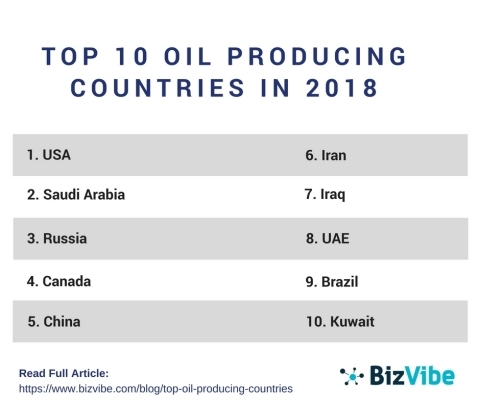 BizVibe, a smart B2B networking platform for global B2B buyers and suppliers, announced today their list of the top 10 oil producing countries in 2018. BizVibe’s global B2B marketplace is the perfect digital community for companies looking to simplify the tedious task of finding suppliers and sourcing products. By signing up, you will not only get quotes quicker but also generate better leads and discover hidden business opportunities. In a recent article titled Top 10 Oil Producing Countries in 2018, BizVibe compiles a list of the top 10 countries that are currently dominating global oil production. In the article, BizVibe reports that the global production of oil totaled 92.65 million barrels per day (b/d) or a total 4,387 million tonnes in 2017, increasing 0.7% from the previous year, which was one of the lowest production growth rates since 2013. However, the top oil producing countries are expected to dominate the global market going forward, despite facing great competition from new factors including the rising trend of production barriers and the adoption of alternative renewable energy. Here are few of the countries that made it to the list of the top oil producing countries in the world. Kuwait’s oil production currently stands out at 2.9 million b/d, and with the growing competition in the Middle East, Kuwait is expected to increase its production by 6 million b/d in coming years. The petroleum industry in Kuwait is the largest industry in the country accounting for over half of its GDP. Kuwait oil reserves are 4th largest in the world with 9.5% of the global reserve. Brazil is the largest producer of crude oil in the whole South American region. The production of oil in Brazil has increased by over 5% year over year. With the rising demand in the international market, the Brazilian government has now increased the imports of oil. The UAE has one of the largest oil reserves in the world. The UAE government has announced that they’ll increase the production of their oil to 5 million b/d in coming years. The major oil reserves in the UAE are in the regions of Abu Dhabi, Dubai, and Sharjah. Iraq has the world’s fifth largest petroleum reserve and it is currently the world’s 7th largest petroleum producing nation. Iraq’s economy is majorly depended on its oil production and imports. More than 90% of the energy generated in the country is from petroleum products. Also, over two-thirds of Iraq’s GDP is directly depended on oil production and its imports. Iran is one of the largest oil-producing countries in the Middle East and second-largest oil exporter in the group of the organization of petroleum exporting countries. Iran has significantly increased its oil production capacity from 3.5 million b/d in 2004 to over 3.7 million b/d in 2017. Not only does BizVibe’s networking platform introduce businesses to verified oil companies around the world, the intelligent B2B networking platform also connects global trade professionals with over 7 million prospecting and sourcing candidates in over 700+ industries. BizVibe cuts research time, allowing you to go after the real opportunities. BizVibe connects like-minded buyers and suppliers to help companies keep up with the market demand. Join for free today to find your next big opportunity in a community of leading oil companies around the world. Increase your company’s exposure. Add your company to the BizVibe network and instantly match with the top exporters, suppliers, and buyers around the world. BizVibe has been specifically designed to help industry professionals connect with like-minded businesses, providing them with a seamless, efficient, and easy-to-use platform. Using cutting-edge technology and advanced match-making algorithms, BizVibe has launched the smartest networking platform on the planet, something that can truly help companies find the right matches. With extensive feedback from communities across multiple industries, BizVibe was able to identify the core problems and uncertainties when finding potential trade partners. Using this feedback, BizVibe developed an efficient networking platform dedicated to buyers, sellers, importers, exporters, manufacturers, and suppliers, helping thousands of users to connect, engage, and make business deals daily. The single-minded focus of BizVibe’s platform is to make networking easier. Over the years, we've searched far and wide to figure out how businesses connect and enable trade. That first interaction is usually fraught with the uncertainty of finding a potential partner vs. a potential nightmare. With this in mind, we've designed a robust set of tools to help companies generate leads, shortlist prospects, network with businesses from around the world and trade seamlessly. BizVibe is headquartered in Toronto and has offices in London, Bangalore, and Beijing. For more information on the BizVibe network, please contact us. Amendment to solicitation M68450-19-Q-X001-0001 has been made to answer questions by potential vendors. See attached amendment.